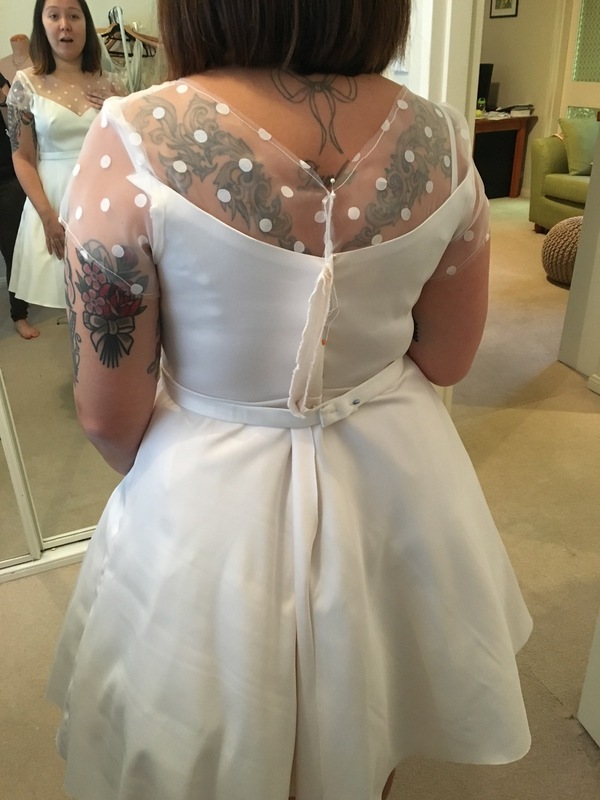 Connie liked the style of my own wedding dress, and requested a simpler style for herself, with a fuller skirt and shorter sleeves. We chose a bigger, bolder polka dot fabric for the yoke and sleeves which matched the size of the covered buttons down the back. Connie's dress had a built in tulle petticoat and she wore a small tulle veil with satin bound edge. As a special request, I also made a co-ordinating dress for Connie's beloved childhood teddy bear, Baby, who acted as the ring bear(er) for the ceremony. Baby's dress had a little sheer pocket for keeping the wedding rings safe.